Account achievements are being shared. All 3 battle pet slots need to be unlocked. Click to configure the settings for this option. Click to reset the settings on this page. Click to resize the screen to fit between the top and bottom borders. Click to return to the main menu. Combat log cannot be hidden while undocked. Dark Soil scanning activated. Reload UI to exit. Dark Soil scanning is already activated. You only need to run this once. Reload UI to exit. Drag the frame overlay to position the frame. Drag the frame overlays to position the frames.|n|nTo change the scale of a frame, click it to select it then adjust the scale slider.|n|nThis panel will close automatically if you enter combat. Enter the spell IDs for the cooldown icons that you want to see.|n|nIf a cooldown icon normally appears under the pet frame, check the pet checkbox.|n|nCooldown icons are saved to your class and specialisation. If checked, a button will be added to the character sheet which will show your equipped item durability when you hover the pointer over it.|n|nIn addition, an overall percentage will be shown in the chat frame when you die. If checked, a group invite will be sent to anyone who whispers you with the keyword INV.|n|nYou need to be either ungrouped or party leader in your own group for this to work. If checked, a master volume slider will be shown on the character sheet.|n|nThe volume slider can be placed in either of two locations on the character sheet. To toggle between them, hold the shift key down and right-click the slider. If checked, a minimap button will be available.|n|nClick - Toggle options panel.|n|nSHIFT/Left-click - Toggle music.|n|nSHIFT/Right-click - Toggle stopwatch.|n|nCTRL/Left-click - Toggle minimap target tracking.|n|nCTRL/Right-click - Toggle errors (if enabled).|n|nCTRL/SHIFT/Left-click - Toggle Zygor (if installed).|n|nCTRL/SHIFT/Right-click - Toggle windowed mode. If checked, additional functionality will be added to the auction house.|n|nBuyout only - create buyout auctions without filling in the starting price.|n|nGold only - set the copper and silver prices at 99 to speed up new auctions.|n|nFind item - search the auction house for the item you are selling.|n|nIn addition, the auction price type and duration settings will be saved account-wide. If checked, additional functionality will be added to the dressup frame.|n|nNude and tabard toggle buttons will be added, model positioning controls will be removed and special model animations will be disabled. If checked, alert frames will not be shown. If checked, all grey items in your bags will be sold automatically when you visit a merchant.|n|nYou can hold the shift key down when you talk to a merchant to override this setting. If checked, backdrops will be tinted blue (friendly) or red (hostile). If checked, battle pets which are automatically summoned will be dismissed within a few seconds.|n|nThis includes dragging a pet onto the first team slot in the pet journal and entering a battle pet team save command.|n|nNote that pets which are automatically summoned during combat will be dismissed when combat ends. If checked, BattleTag and Real ID friend requests will be automatically declined.|n|nEnabling this option will automatically decline any pending requests. If checked, chat frame buttons will be hidden.|n|nClicking chat tabs will automatically show the latest messages.|n|nUse the mouse wheel to scroll through the chat history. Hold down SHIFT for page jump or CTRL to jump to the top or bottom of the chat history. If checked, chat text will not fade out after a time period. If checked, class coloring will be used in the player frame, target frame and focus frame. If checked, confirmations will no longer appear when you choose a loot roll option or attempt to sell or mail a tradable item. If checked, converting a party group to a raid group will succeed even if there are low level characters in the group.|n|nEveryone in the group needs to have Leatrix Plus installed with this option enabled. If checked, cooldown duration numbers will not be shown over the cooldowns.|n|nIf unchecked, cooldown duration numbers will be shown over the cooldowns if they are enabled in the game options panel ('ActionBars' menu). If checked, crafted items will no longer show the name of the crafter. If checked, damage and healing numbers in the player and pet portrait frames will be hidden. If checked, dragging the General chat tab while the chat frame is locked will expand the chat frame upwards.|n|nIf the chat frame is unlocked, dragging the General chat tab will move the chat frame. If checked, duel requests will be blocked unless the player requesting the duel is in your friends list or guild. If checked, emote sounds will be silenced while your character is:|n|n- resting|n- in a pet battle|n- at the Halfhill Market|n- at the Grim Guzzler|n|nEmote sounds will be enabled when none of the above apply. If checked, enemy nameplates will be shown during combat and hidden when combat ends. If checked, guild ranks will be shown for players in your guild. If checked, most error messages (such as 'Not enough rage') will not be shown. Some important errors are excluded.|n|nIf you have the minimap button enabled, you can hold down the control key and right-click it to toggle error messages without affecting this setting. If checked, party invitations from friends or guild members will be automatically accepted unless you are queued in Dungeon Finder. If checked, party invitations will be blocked unless the player inviting you is in your friends list or guild. If checked, pet battle duel requests will be blocked unless the player requesting the duel is in your friends list or guild. If checked, quests will be selected, accepted and turned-in automatically.|n|nQuests which have a gold, currency or crafting reagent requirement will not be turned-in automatically.|n|nYou can hold the shift key down when you talk to a quest giver to override this setting. If checked, raid chat and instance chat will both be colored blue (to match the default party chat color). If checked, repair costs will be taken from guild funds for characters that are guilded and have permission to repair. If checked, requests initiated by your party leader to join the Dungeon Finder queue will be automatically accepted if the party leader is in your friends list or guild.|n|nThis option requires that you have selected a role for your character in the Dungeon Finder window. If checked, resurrection requests will be accepted automatically as long as the player resurrecting you is not in combat.|n|nResurrection requests from a Brazier of Awakening or a Failure Detection Pylon will not be accepted automatically. If checked, spell IDs will be shown in buff icon tooltips located in the buff frame and under the target frame. If checked, sticky chat will be disabled.|n|nNote that this does not apply to temporary chat windows. If checked, summon requests will be accepted automatically unless you are in combat. If checked, the addon list (accessible from the game menu) will show character based addons by default. If checked, the amount of time it takes to auto loot creatures will be significantly reduced. If checked, the backpack clean-up button and the bank frame clean-up button will not be shown. If checked, the boss banner will not be shown.|n|nThe boss banner appears when a boss is defeated. It shows the name of the boss and the loot that was distributed. If checked, the button to toggle the raid container frame will be shown just above the raid management frame (left side of the screen) instead of in the raid management frame itself.|n|nThis allows you to toggle the raid container frame without needing to open the raid management frame. If checked, the clock will be hidden. If checked, the combat log will be hidden.|n|nThe combat log must be docked in order for this option to work.|n|nIf the combat log is undocked, you can dock it by dragging the tab (and reloading your UI) or by resetting the chat windows (from the chat menu). If checked, the 'Display only character achievements to others' setting in the game options panel ('Social' menu) will be permanently checked and locked. If checked, the editbox will be moved to the top of the chat frame. If checked, the game world will be resized to fit between the top and bottom borders.|n|nNote that if you enable this setting, the transparency slider will no longer affect the top and bottom borders. If checked, the gossip window will not be shown when you talk to an active garrison bodyguard.|n|nYou can hold the shift key down when you talk to a bodyguard to override this setting. If checked, the grey screen of death and the netherworld effect will be disabled. If checked, the level-up display will not be shown.|n|nThe level-up display shows encounter objectives, level-ups, pet battle rewards, etc. If checked, the main bar gryphons will not be shown. If checked, the order hall command bar will not be shown. If checked, the screen glow will be disabled.|n|nEnabling this option will also disable the drunken haze effect. If checked, the social button and quick-join notification will be hidden. If checked, the stance bar will not be shown. If checked, the talking frame will not be shown.|n|nThe talking frame normally appears in the lower portion of the screen when certain NPCs communicate with you. If checked, the tooltip will be color coded and you will be able to modify the tooltip layout and scale. If checked, the tracking button will be merged with the calendar button.|n|nLeft-click the tracking button to show the tracking menu or right-click it to show the calendar. If checked, the zone text bar will be hidden. The tracking button tooltip will show zone information. If checked, the zoom buttons will be hidden. You can use the mousewheel to zoom regardless of this setting. If checked, tooltips for world units will be hidden during combat.|n|nYou can hold the shift key down to override this setting. If checked, unit targets will be shown. If checked, Wowhead links will be shown in the world map frame and the achievements frame. If checked, you can hold down the alt key while opening a gossip window to automatically select a single gossip option. If checked, you can hold down the control key and click a chat tab to view recent chat in a copy-friendly window. 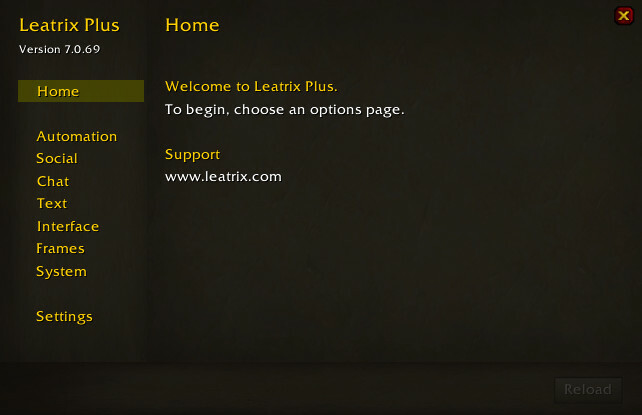 If checked, you can open Leatrix Plus by pressing CTRL/Z. If checked, you can press the arrow keys to move the insertion point left and right in the chat frame.|n|nIf unchecked, the arrow keys will use the default keybind setting. If checked, you will be able to cancel cinematics without being prompted for confirmation. If checked, you will be able to change the font size of quest text.|n|nEnabling this option will also change the text size of other frames which inherit the same font (such as the Dungeon Finder frame). If checked, you will be able to change the font size of standard mail text.|n|nThis does not affect mail created using templates (such as auction house invoices). If checked, you will be able to create a viewport. A viewport adds adjustable black borders around the game world.|n|nThe borders are placed on top of the game world but under the UI so you can place UI elements over them. If checked, you will be able to customise the minimap. If checked, you will be able to drag the chat frame to the edge of the screen. If checked, you will be able to place up to five beneficial cooldown icons above the target frame. If checked, you will be able to reposition the tooltip. If checked, you will be able to save your current battle pet team (including abilities) to a single command.|n|nA button will be added to the Pet Journal. Clicking the button will toggle showing the assignment command for your current team. Pressing CTRL/C will copy the command to memory.|n|nYou can then paste the command (with CTRL/V) into the chat window or a macro to instantly assign your team. If checked, you will be able to show a rare, elite or rare elite chain around the player frame. If checked, you will be able to zoom out to a greater distance. If checked, you will release automatically after you die in Ashran, Tol Barad (PvP), Wintergrasp or any battleground.|n|nYou will not release automatically if you have the ability to self-resurrect (soulstone, reincarnation, etc). If checked, your bags will not be opened or closed automatically when you interact with a merchant, bank or mailbox. If checked, your chat history will increase to 4096 lines. If unchecked, the default will be used (128 lines).|n|nEnabling this option may prevent some chat text from showing during login. If checked, your gear will be repaired automatically when you visit a suitable merchant.|n|nYou can hold the shift key down when you talk to a merchant to override this setting. If checked, zone text will not be shown (eg. 'Ironforge'). Invalid battle pet team parameter. Leatrix Plus will not overwrite LeaPlusDB at next logout. No bad sound IDs found. No help is available for this page. No items with durability equipped. NOTICE!|nYou must fully restart your game client before you can use this version of Leatrix Plus. Pet not found. Only owned pets that are currently showing in the journal can be searched. Requires you to be interacting with Larana Drome. She can be found at Scribes' Sacellum, Dalaran, Northrend. Select the settings that you want to use. This command will assign your current pet team and selected abilities.|n|nPress CTRL/C to copy the command then paste it into a macro or chat window with CTRL/V. This panel will close automatically if you enter combat. To begin, choose an options page. To use the Find Item button, you need to deselect the WoW Token category. Use Leatrix Plus to move that frame. Use Leatrix Plus to reset that frame. Value must be a number. You cannot do that in combat. You do not own this pet. Only owned pets can be searched. You need a battle pet team. Your UI needs to be reloaded for some of the changes to take effect.|n|nYou don't have to click the reload button immediately but you do need to click it when you are done making changes and you want the changes to take effect. Your UI needs to be reloaded.